Not something i've tried, but i will be this year. Heat up some brown sugar in a pan, and then add the gin and warm it through. Then pour it over the sloes. I've sampled some made in this way and it was delicious. I`m with you Zapp, Just bottled 5 galls of Muntons Gold Pilsner (extract type) into Grolsch type bottles and will be doing a batch of Woodfordes Werry as soon as. Nice one H, I've done both and found them to be very enjoyable. Good move bottling the Pilsner, it needs to be served at pressure and cold, which would have been difficult in a keg. I'm an all grain brewer too, and happy to pitch in any advice or help can. 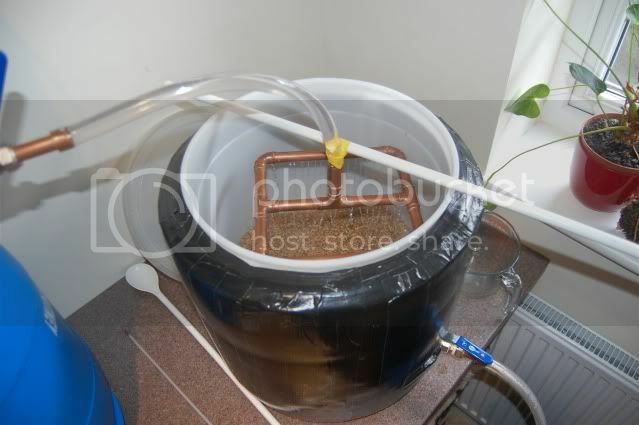 When I get 5 minutes I'll dredge up some pictures showing how you can cobble together a basic set up to make great beer for very little capital expense. All grain calls for much more equipment than other brewing methods, so the initial outlay is a lot higher. This is offset over time though, as all grain beer is (in terms of ingredients costs) much cheaper per pint than any other method. Here is a description of a process using very basic equipment. I will include details of the more advanced processes and equipment I use in red. Having typed this, it sounds way, way more complicated than it is. Dont be put off. 1. A boiler with at least (in my opinion) 25 litre capacity. These take the form of a heat resistant food-grade bucket fitter with at least one kettle element and a tap, into which can be plugged a hop strainer. 2. A 30 litre mashtun. 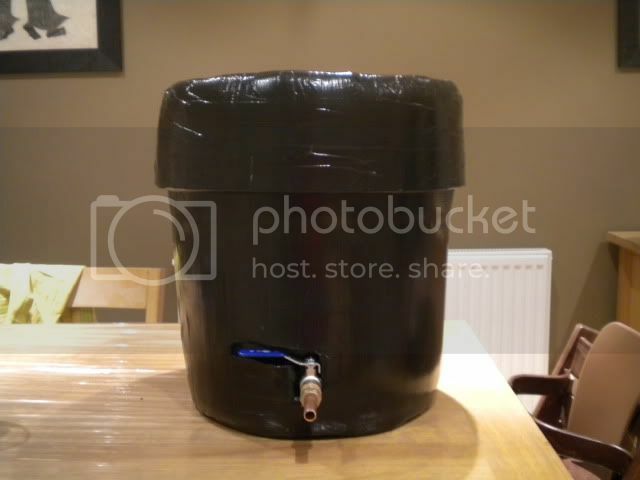 These are usually made from 30 litre picnic coolers, which are drilled to accept a tap. 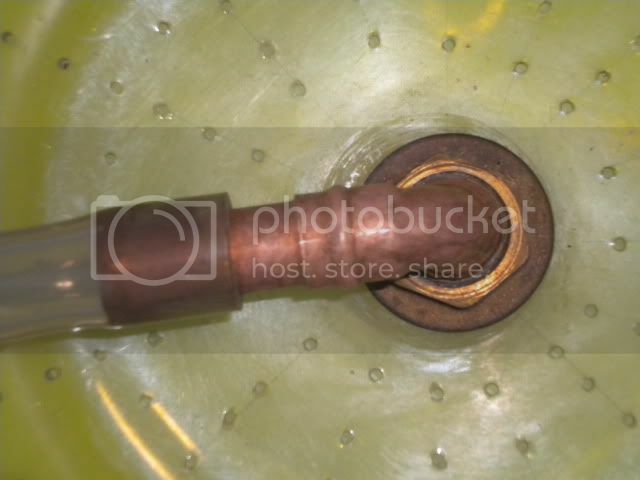 The tap is then connected via a flexible heatproof hose which in turn connects to a copper pipe matrix cut with downward facing slots which sits inside the tun. The water is added to the mashtun, and the grain is stirred in. Once the combined temperature of water and grain settles at the desired mash temperature (66 degrees in this case), the lid is placed on the picnic cooler mashtun and it is then insulated by placing it on a towel and (in my case) wrapping in old sleeping bags. This is done to minimise heat loss as the grain mashes, or 'steeps'. The purpose of mashing at a given temperature is to encourage the correct balance of enzymic activity in the mash so that you extract the desired levels of sugars from the grain. Once insulated, the mash is left for 1.5 hours (some mash for 1 hour). We have refilled our boiler with enough water to replace that used in the mash in order to have enough final raw wort (extracted sugars in water) to make our beer. I use a very large boiler, which allows me to treat and heat all my water in one go, so no refilling. This water is heated to 80-85 degrees. Once our 90 minute mash is done, we open the mashtun, place it under the boiler tap and then 'top up' with a predetermined amount of water based on our batch sparge calculation. This water is mixed into the mash. We then open the mashtun tap to draw off a litre, which is gently poured back into the mashtun, to try to get the grain to act as a filter. This is repeated a couple of times. 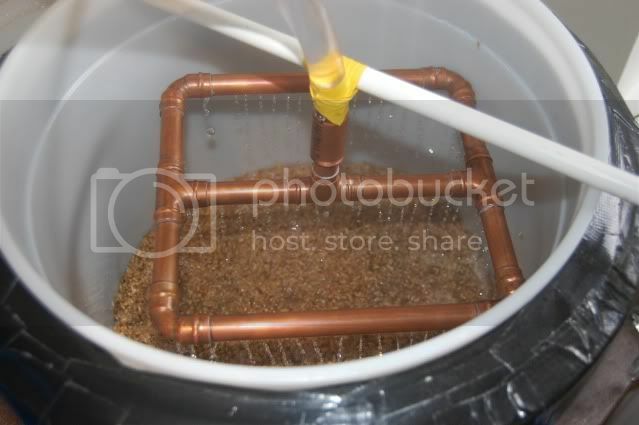 Once the wort is clearer, the mashtun is drained into the bucket. Now the remainder of the hot water is added to the grain. This is the batch sparge. The mashtun is then closed and insulated again for a further 30 minutes. This ensures all of the sugar is extracted. This step and topping up differs from other measures like fly sparging, which I will describe later. 3. 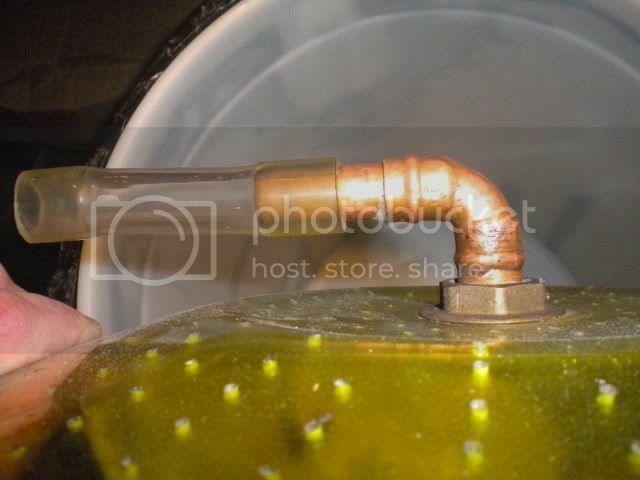 Now that the boiler is empty, the Hop Strainer is fitted to the tap on the inside of the boiler. 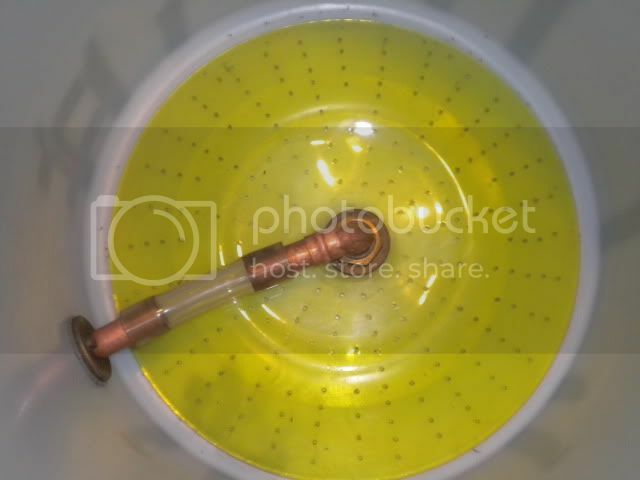 This is a simple tube of copper pipe drilled with a matrix of holes, and its purpose is to allow the finished "beer" to flow through, leaving the hops and other matter behind. Once the strainer is fitted, the first batch of wort can be poured into the boiler. After 30 minutes, the second batch of wort is run from the mashtun into the bucket. This is then added to the boiler, being careful to leave space so it does not boil over in the next stage. Having a massive boiler, I am able to add all the wort at once and control the level of evaporation by controlling the boil intensity. Now it is time to boil the wort. This kills bacteria, intensifies flavours and extracts flavour and aroma from the hops. The boiler is switched on, and the wort is brought to the boil and then kept boiling for 60-90 minutes. Once the wort is boiling, hops are added. Hops added at this point in the boil contribute bitterness. As the wort comes to the boil, a scummy foam will form and then dissipate. This is the "hot break"; unwanted proteins from the mash that will remain in the boiler at the end of the process. 30 minutes before the end of the boil, I introduce my wort chiller, which is a length of coiled copper pipe which will carry cold water through the boiled wort. This is not essential but is definitely recommended. It is introduced at 30 mins from the end of the boil to sterilise it. 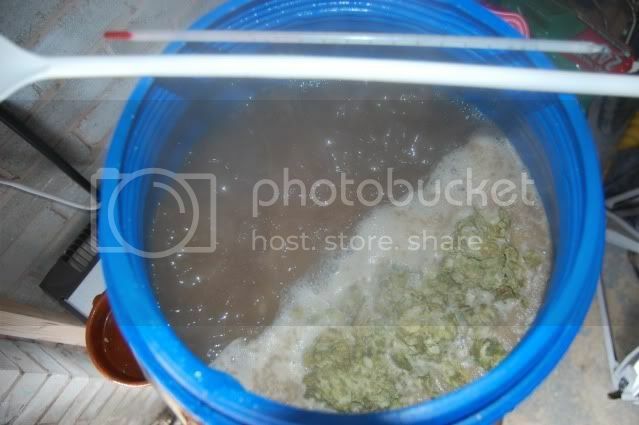 In order to introduce hop flavour and aroma, you may also wish to add hops at later stages, perhaps 20, 15, 10 and 5 minutes, and then again when the boiled wort is at 80 degrees. At 10 minutes from the end of the boil I add "copper finings". These are often made of seaweed or fish extracts and will help the unwanted proteins settle out of the wort at the end of the boil. Once the boil is complete, I plug my chiller in to the tap and run cold water until it is around 25 degrees. With minimal kit you can either cool the wort in a cold bath (if you fancy carrying 23 or more litres of boiling, sugary liquid to the bath) or risk infections from airborne bacteria by allowing it to cool naturally. Once the wort is cooled to around 25 degrees, it is run off via the boiler tap into a sterilised and rinsed fermenter. Once this is done, yeast (which was rehydrated in a little COOLED boiled water) is added. You are now done. The beer (depending on the strength and type of yeast) should be fermented in around a week. At this point, it can be bottled or kegged, and then drank in 3-5 weeks. Note: Water is a very important component in beer. A lot of authorities put chloramines into water. These MUST be removed or your beer will taste of old trainers and sticking plasters. Chloramines can be removed most easily by adding half a campden tablet (potassium or sodium metabisulfite in tablet form), which are available from most places that sell any kind of brewing equipment, to each 20 or so litres of water. DONT sniff them when you open the pot, or you will feel ill for days. I speak from experience. Thats enough for today, I cant type anymore! Nice one Jonty. Have a read of my post please and see if I have missed anything. I was pretty wordblind by the end. Pretty much hit the nail on the head there Zap!! I do mine slightly differently as I fly sparge but the end results and the basic process are the same. It does sound difficult or complicated on paper, but is really straightforward in practice, I'd be happy to give anyone in the North a hands on brew day if they were interested. If you can knock hides together, follow game recipes and fettle your shooting kit, you can definatelt make good beer too. 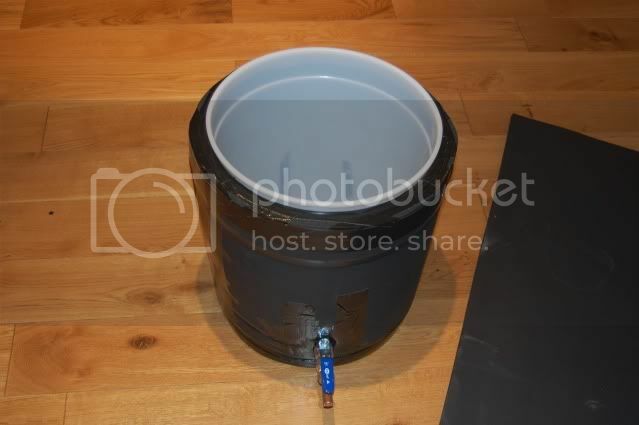 Here's a 'how to' guide I posted e week or two back on a mates forum, I'm currently building a new 100l stainless set up so the kit shown here will be up for sale for a cheap price in the very near future. I'm in the middle of building a new set up so this is a series of pics from my old kit - but it's suitably heath robinson to show how you can do it on a budget. A typical all grain breweery requires 3 vessels, shown here top to bottom, Hot Liquor Tank (HLT) Mash Tun and Boiler. 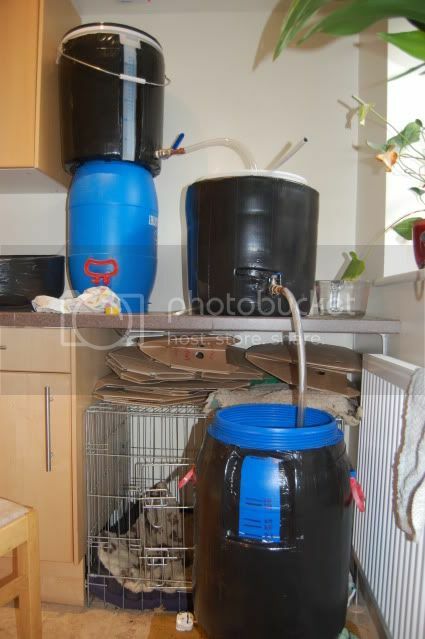 This is a simple gravity fed system which avoids the need for pumps. The HLT is effectively a kettle, it's only job is to heat water to the required temperature for two stages of the brewing process. The Mash Tun is pretty much a heavily insulated bucket, it's job is to hold a load of grain and hot water at a constant temperature for 90 minutes. The boiler is... well a boiler, needed to boil the wort (unfermented beer) for 60-90 minutes. 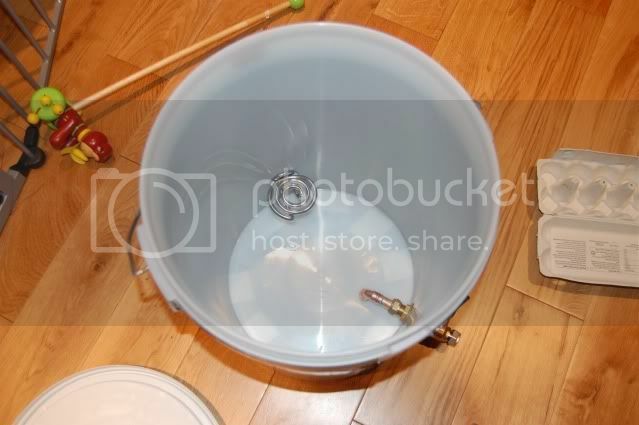 My HLT is a fermenting bucket with a ball valve tap and an element taken from a tesco value £5 kettle. The foam is insulation to reduce heat loss. 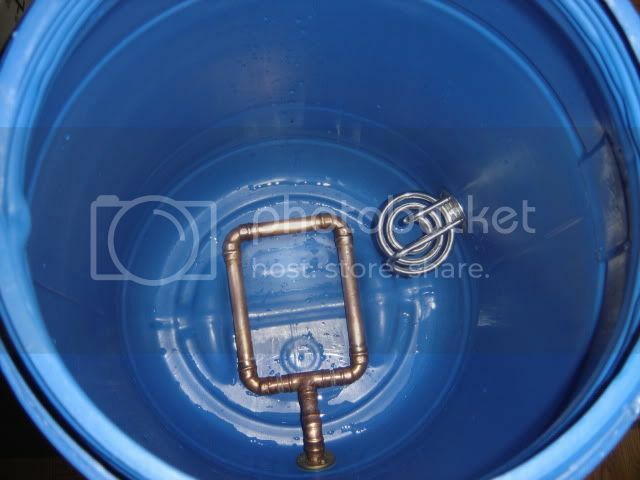 The mash tun is another fermenting bucket with a perforated false bottom (to act as a filter to stop grain coming through the tap), a ball valve tap and a lot of insulation. I used foam matting, some people use camping mats, or rather than a bucket, use a camping cool box. The boiler just needs to be able to hold a boil for 60-90 minutes depending on the recipe. 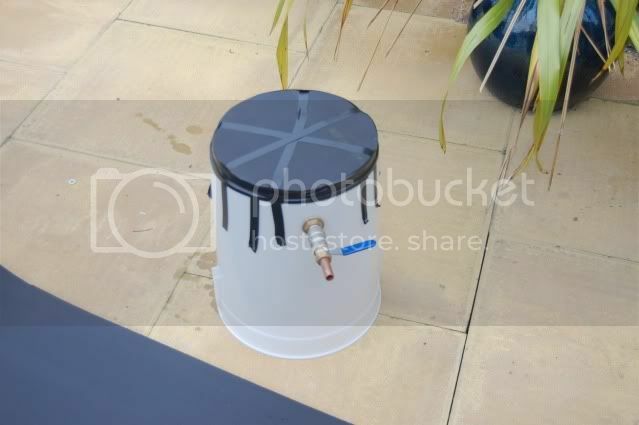 They can range from a bucket with kettle/immersion heater elements to stock pots on gas rings to electric tea urns. 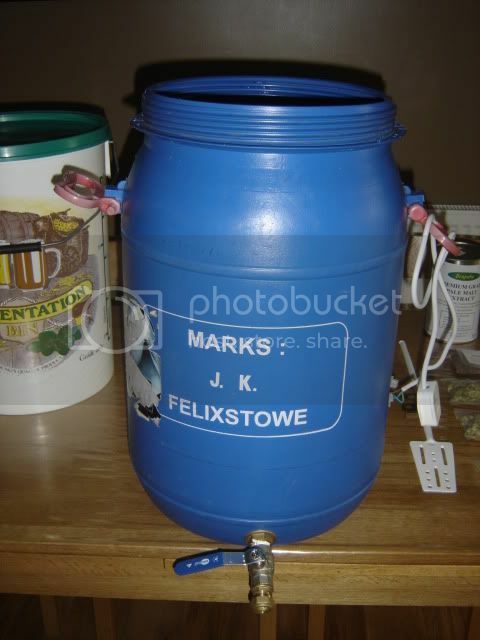 Mine is a mango chutney barrel blagged from my local takeaway, fitted with 2xteco kettle elements and a ball valve tap. The copper pipe in the bottom is a manifold with holes drilled in the underside to act as a filter to stop hops getting through the tap. I added the 2nd element later by the way. The first stage is the mash - you mix your grain with hot water to form a porridge in the mash tun, get the temp to a steady 66 degrees and then close the lid and leave to mash for 90 minutes. This mash brings the sugars out of the grains and into the water, the sugars are the fermentables which makes the beer alcoholic, also, the mix of grain gives the beer it's underlying flavour. The mash gets the bulk of the good stuff out of the grain, but not all of it. So once you've drained the liquid out of the masth tun, you then sprinkle more hot water over the grains to get the rest of the goodness out. 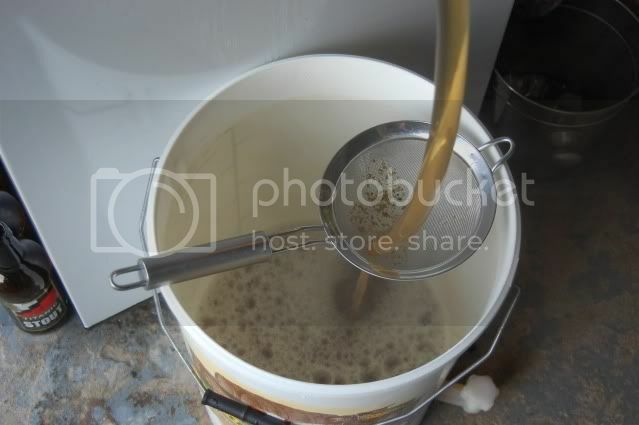 This is called sparging, you can do this with a rotating fancy arm, a jug, a shower head or a watering can if you like. I made this copper head to disperse the water - it's important not to disturb the grain bed if possible. As everything is gravity fed, you've got water coing in from the HLT, draining through the mash tun and been collected in the boiler. Once you've got your required quantity in the boiler, its time to... well, boil it. The wort that you've collected is sweet malty water and needs hops to be added to provide bitterness and flavour/aroma. The reason the boil has to last at least an hour or so is to get the bitterness out of the hops and into the wort, I suppose a bit like a well mashed pot of tea. Depending on the recipe, you add different types of hops at diffenet times during the boil, but it's usual to add some towards the end of the boil to provide aroma and flavour without the astringency. Brilliant post Jonty :good: . Did you post some of those pics on Jims? I'm sure I've seen it whilst browsing. Nice setup you have too. 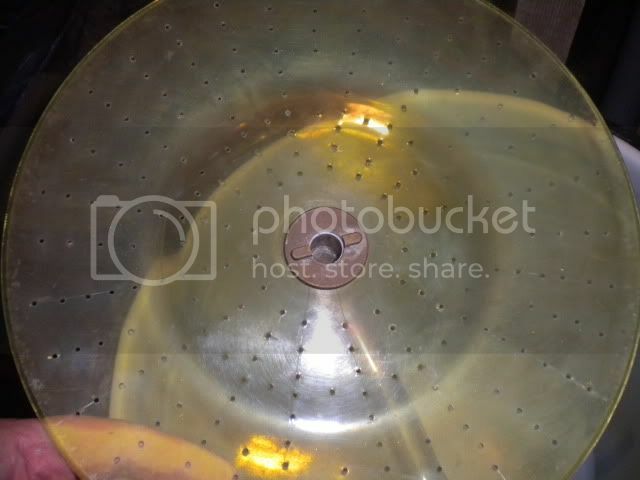 Do you get much deadspace on your mashtun using a false bottom? I quite fancy something along those lines to increase my overall capacity, but dont want to lose loads whilst running off. Yes mate, I'd only done kits till I found out about Jims, then what I thought was a black art and had discounted as impossible seemed quite achievable. I made a compilation of pictures to show the whole process to show it's not that complicated and really, anyone could have a bash. Don't be put off by the false bottom, it leaves less than half a litre of liquid, which is easilty accountable for in your pre-brew calculations. Would be happy to send you some more detailed pics if you wannted. Good stuff lads Depending on how things go this Autumn I may do something similar for cider as I know a few on here have expressed an interest and some have even dabbled themselves with a bit of rough guidance..! Hope you've not been laid up Ack-Ack...! Likewise, I was lucky enough to be close to an AG brewer (the guy who runs the CopperKettle homebrewing site if you know it) who demystified the whole thing for me. 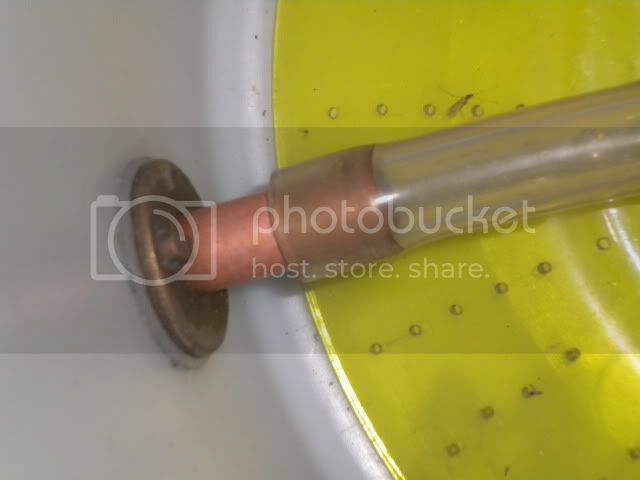 Is the false bottom of the Daab "drilled plate" type? I'd be interested in some pics if you wouldnt mind. Good to find another AG type on here. Drewthebrew off the BIY site is a member on here if that rings any bells. 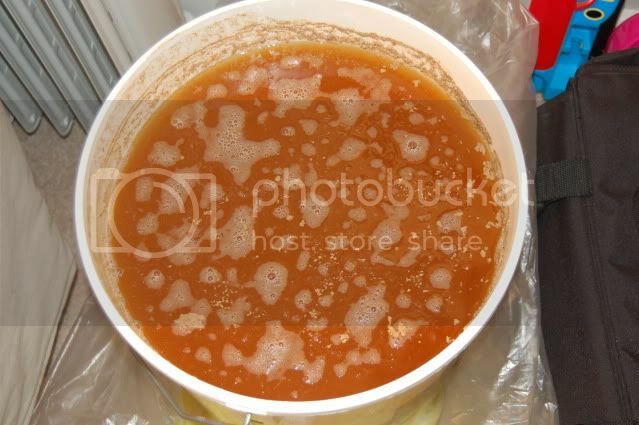 EDIT: Twitchynick, there are cider kits available, or you could take the plunge and go for the dreaded "Turbo Cider"... (100% pure supermarket apple juice fermented to produce a very nice, very dangerous brew. Very easy to do!). Oooooooooh. Now that I have to try! My first kit is on the go at the moment but this looks oh so much more appealing! just on my second brew. 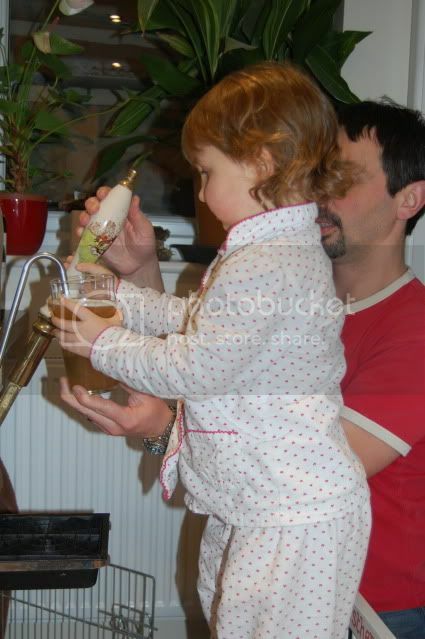 homebrewing is so easy from kits. this allgrain stuff is too difficult, as i dont have any of the equiptment. it is alot of fun ! Thanks for the info, think I will try and get my head round it and give it a go, I live on a farm and work in a grain store so getting grain is not a problem but the rest of it I will have to look for. It is mate, very easy to do, apart from drilling all the holes which is a bit dull, I'll take the tun apart later and get a few pictures. Unfortunately it isnt as easy as that. You need malted barley, not raw grain, to make beer. Malting on a large enough scale would not be viable compared to the price of buying it in. 25 kilos of base malt goes for £25-28 normally, and is enough to make around 200 pints of 4% ale. yeah those woodfordes kits are expensive but foolproof. you dont need to add anything else. with the cheaper kits at half the price, are value beer. a kilo of sugar and you have beer. i`ve seen single can kits at £11 and woodfordes 2 can at £25. thats a big difference. for the addition of either £5 bag of spraymalt and or brewing sugar, the single can brews are cheap enough to have a play. £11 kit + £2 sugar for simple bru and +£5 for a spraymalt. i have only just come to the realisation that i need a keg. first, there is some initial outlay, its with every hobby, right it off dont even think about it. 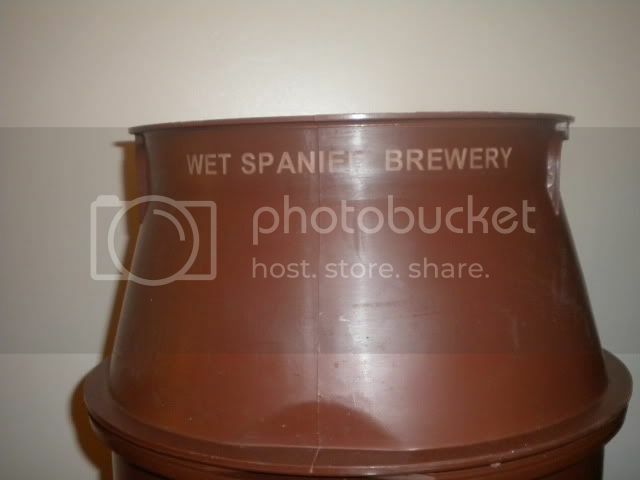 from what i gather brewing bins dont last forever, but they do if you dont use it ! one thing i found the most troublesome, is getting the extract from the tin. i couldnt get it all from the tin first time. second time i changed the way i did things. 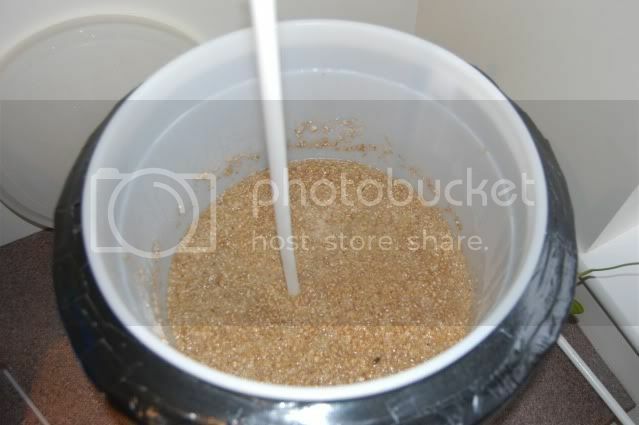 heated up some water in alarge pan in stove (4 litres), when its hot turn it down, chuck in sugar / spraymalt, stir it in. open can of extract, poor it in and stir. boil a kettle. pour boiled water into the can, stir the left behind stuff. puck up can with oven mits, get it all in the saucepan. mix and heat alittle untill smooth and disolved. to the prepared water that should be in the fermenter, poor in the hot contents of the saucepan. slap a thermometer strip on. when i did this it hit 25 C instantly. needed 24, wait half an hour, 24c chuck in yeast. lid on and walk away. i stick to stout, as it is the juice from the heavens. not at all like lager. here is a sumary of the brew that i done. 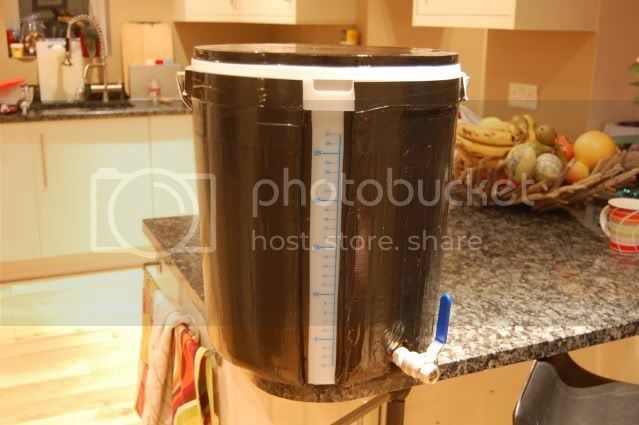 1-john bull stout, +1kg brewing sugar to 22 litres. very thin will have to do again. very light stout but i rushed through the brew. 2- EDME superbrew stout, 1kg of dark spraymalt, 150grams black treacle, 22 litres. just on primary fermentation. it smells gorgeous. esp with the spraymalt added. BIY forum and website closed a few weeks ago. No idea what happened but there was a lot of bad press on the forum before it finally closed. I'll look out for the HB threads and help out where I can. On kits, generally speaking, you get what you pay for. If they cost more its because there are more expensive ingredients in there. People expect a cheap kit to taste like nectar, try it after a few weeks and never brew again which is a shame. Buy decent kits, give plenty of time to mature and enjoy ! 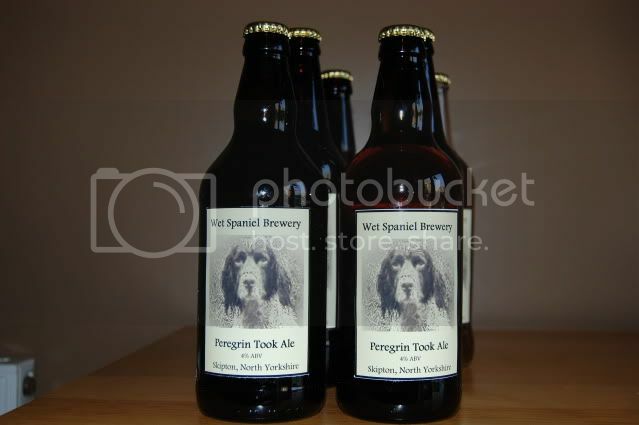 Its a while since I brewed kits but I'll advise on which kit to buy - just dont expect it to taste exactly like your favourite pint - it will be in the style of. If there are any AG brewers in the north who want some cheap malt I will be picking some up from Fawcetts soon - will be around £15 a sack which is a huge saving. If theres anyone who wants to learn how to brew All Grain and has a day to spare I am more than happy for them to join me on a brewday. Can even provide samples and a bacon butty through the day. here's some pictures of that false bottom - I know I'm going to get the p*** taken because it's dusty and there's a dead fly on it, but that's what gives my beer it's unique flavour. It's basically a tank connector through the mash tun wall to a ball valve, a tank connector through the plate with a 90 degree fitting and some short lengths of 15mm copper and then a piece of 1/2" beer line to connect the two firrings together. 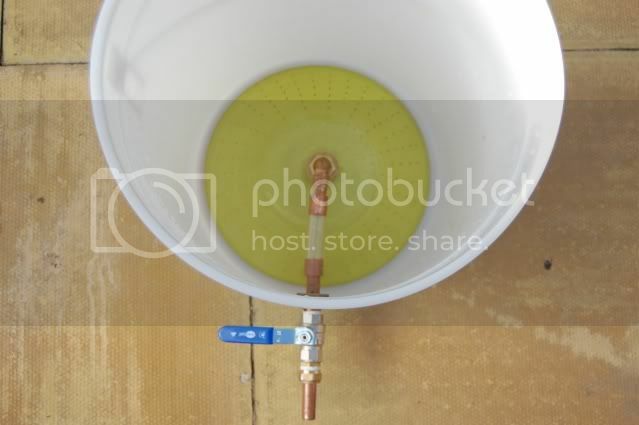 As long as you utilise the syphon effect by attaching a shorth length of pipe to the outlet tap to make sure it is below the actual base of the tun it pretty much drains out. That is a very neat setup. What sort of grain and water quantities can it handle?